There are some days when I love a challenge. Yesterday was one of those days. When I came home from our road trip over the weekend, I brought back a sewing machine I had purchased along with a sewing desk for my sister. When I purchased the desk, the seller said that "I'll throw in the sewing machine for $10, I can't get it to sew right". I said OK. That was probably 4 months ago. 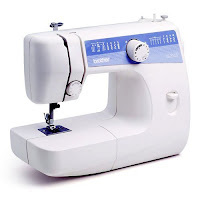 The sewing machine was a very basic Brother LS-2125i. When I pulled it out and set it up yesterday, nothing came with it. I had to hunt down the manual on the Internet... no problem. Took me forever how to figure out how to pull out the spool thread pin. This machine has a bobbin case. Luckily I'm familiar with how temperamental their tension adjustments are from my Long Arm. Fixed that, check. Finally, it only came with one foot. Something with blue edges...Finally figured out this must be some type of gathering foot. I switched out the foot with a low shank snap on foot I had from my current machine and whala...sewed like a sturdy little machine. Success!! Now, a good oiling based on the manual and I have a machine for all those iffy projects you don't want to sew on your "good machine"